With St. Patrick’s Day only a few days away, I’m continuing to share some of my favorite traditional Irish food. 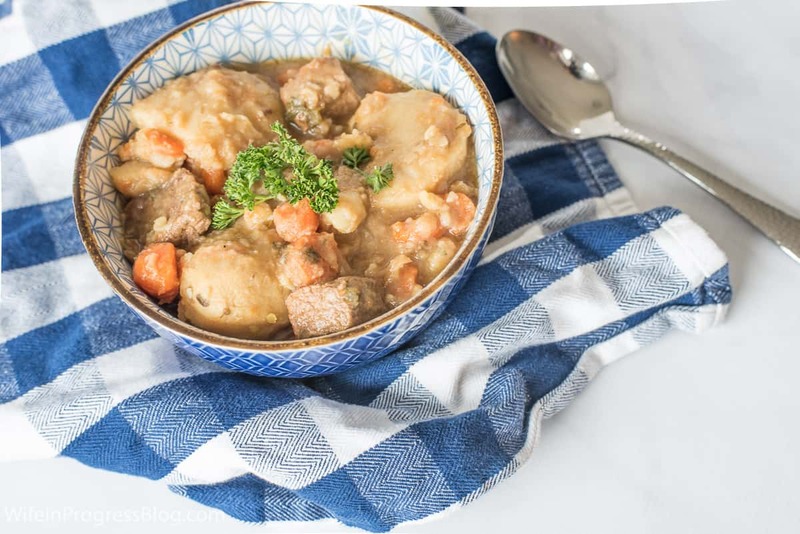 This Traditional Irish recipe for beef stew is a simple but delicious dinner time meal for families. Everyone in my house adores it – 3 year old and 1 year olds included! 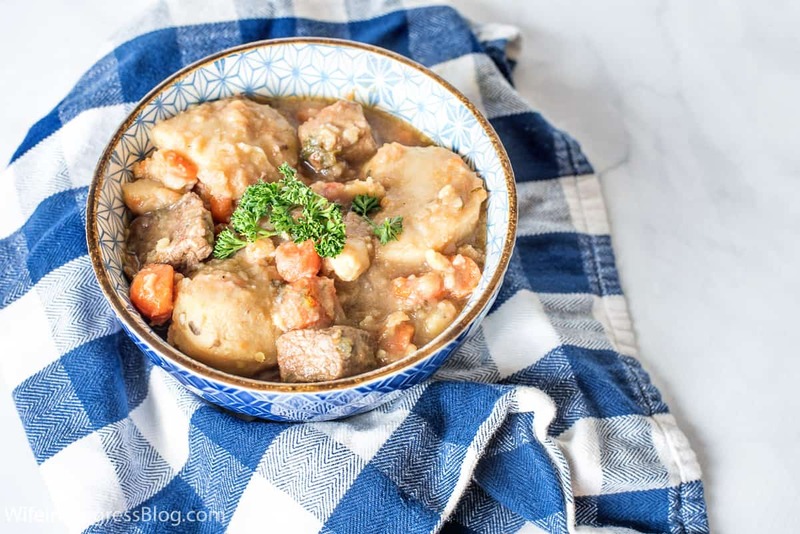 What’s in a Traditional Irish Stew? An authentic Irish stew is traditionally made with beef and lamb (or mutton). Around here, I can usually only find lamb in the spring when it’s in season so for the rest of the year I choose to just make a beef stew with potatoes and carrots. You can of course add in other vegetables like turnip (I like it this way, too!) and some people add celery (which I don’t eat). The longer you cook the stew and allow the flavors to combine together and the potato to break down, the thicker the stew will be. My mom always made stew with dumplings, so the flour is those also really helps to thicken everything up. If by the end of the cooking process the stew is not thick enough for your liking, simply add some flour or cornstarch and cook it for another 10-15 minutes to thicken the gravy up. 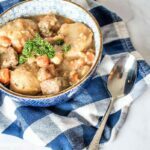 Can This Irish Stew Recipe Be Made in The Slow Cooker? Absolutely! This is in essence a slow cooker (or crock pot!) recipe since it’s important to let it cook for several hours. I have a big “stewing pot” that I use but I’ve also used my slow cooker that has a built-in searing feature. How Do You Make an Irish Stew? The recipe is below! The amounts I specified are purely for guidance. Sometimes I use less potatoes or more depending on whether I want leftovers or not. I mean, I ALWAYS want leftovers. Next day stew is even better than the first day’s :-) But feel free to play around with the amounts as you see fit. How do you make traditional Irish stew? My authentic recipe using beef and lamb is below! Making sure meat is cut into even pieces, season with salt & pepper, then dredge with flour. On a medium to high heat, sear the meat to seal in the juices. Once every side of the meat is brown, set aside. Quarter potatoes and place them along with the chopped carrots and onion into a large pot or dutch oven. Fill will just enough water to cover them. Bring to a boil then allow to simmer until the potatoes are just about soft enough to prick with a fork. Add the beef stock, seared meat, worcestershire sauce and parsley. Leave to cook on a low heat for a minimum of 3 hours. I like to make my stew early in the morning and leave it cook all day long. This intensifies the flavors for the best tasting stew. If you choose to add the dumplings, they will get added in the final hour. Sieve the dry ingredients into a bowl. Add the parsley and diced butter. Add enough mix to make a dough that comes together. It should be a bit sticky. Drop into the stew and cook for the final hour with the lid on. Optional vegetables to add: Turnip and/or celery. Lamb is optional but adds a nice flavor. I only use lamb in the spring when it's in season, I make my stew with just beef in the winter. While I choose to make my stew in a pot, you can of course use a slow cooker since this is in essence a slow cooker recipe. Once the meat has been seared, set the stew on high for 30 minutes to an hour and then low for as long as needed. Hi Steve, I’ve never tried it but I don’t see why not!